Life is hectic, especially for families. Baseball practice overlaps with debate club, which overlaps with ballet class, which ends 10 minutes before parent-teacher conferences. Doctor’s appointments, tennis lessons, tutoring, homework, work meetings, grocery shopping, bill paying—all of our responsibilities fuse into an intimidating cloud of busy. Meals become a frustratingly necessary part of our day, and food is suddenly all about convenience and efficiency. Dinnertime just doesn’t seem as pressing as “SAT prep” or “dance recital,” and we get that. 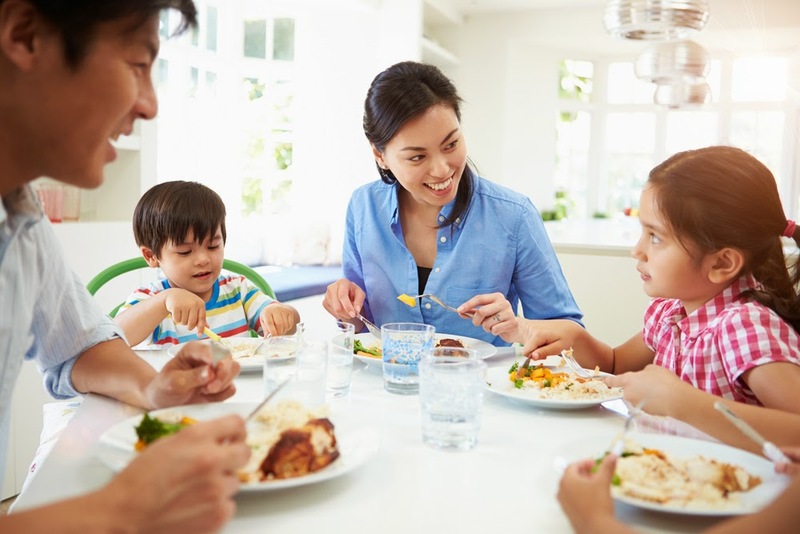 So we’ve put our heads together to come up with a few important reasons why you should prioritize dinnertime—and why your family will thank you. Communication. No matter what age we are, talking with people older and younger than us is a useful way to learn effective communication. Parents and older siblings teach younger family members new words, and conversations with adults challenge kids to speak eloquently—or at least without using the words “like,” or “um.” Arguments that inevitably erupt at the dinner table require conversation and reason, not foot stomping and door slamming. When leaving the room is no longer an option, we challenge our kids to calmly face conflicts as they arise. At the dinner table, fights become debates, and petulance no longer passes as a valid way to win. Justice. As silly as it sounds, the family unit is a child’s first introduction to the justice system. The best place to make a case—or appeal a previous ruling—is at the dinner table. Kids learn how to argue meaningfully with adults, using facts and reason. They learn how to evaluate and negotiate with their audience. Values. Family dinners foster conversations about everything from weather to politics to gossip to grades. Sitting down to family dinner, you are not distracted by technology or the work that is crowding your life; you are fully present for your family, and you are completely attentive to your children. Dinners keep your family connected. Manners. A toddler’s messy affection for pasta sauce might be endearing now, but eventually that toddler will be going on dates and attending business dinners. It’s almost guaranteed that your child will not be making a business deal after dipping an investor’s tie in steak sauce. Family dinners help teach your kids how to behave properly at the table, and trust us, the world thanks you.